Oh, mama… mtDNA can be useful after all! I’ll admit it: I’m a DNA junkie. Throw out a test that I can take (or con, uh, convince a cousin to take), and I’m there — I’ve done as much testing of my own DNA as I can afford: Family Finder and the Full mtDNA Sequence (FMS) from Family Tree DNA and the Relative Finder from 23andMe. Okay, so I haven’t sprung for the full genomic sequence yet. Ten thousand dollars1 is just a wee bit rich for my blood. But check back with me when it hits the $1,000 mark. All that being said, I’ll also admit that it took me practically forever to see any practical reason to do mitochondrial DNA (mtDNA) testing. That’s the DNA that’s passed only from a mother to her own children, and, in turn, only her daughters can pass it on.2 So where YDNA is passed from father to son to son, mtDNA is passed from mother to daughter to daughter. So when I did the test, I did it more out of curiosity than any hope of a genealogically-useful match. Turns out I’m haplogroup7 H3g. Whoopee. Haplogroup H is the most common mtDNA haplogroup in Europe,8 and the H3 subclade9 doesn’t have any interesting little quirks like, oh, I dunno, descent from an ancient Egyptian priestess or some cavewoman from the Pyrenees. Exciting, it’s not. Well, yeah, all right, I’ll grant you that Jimmy Buffett is also H310 and that I do like margaritas, but I’m not sure just how useful that is on a day to day basis. Now don’t get me wrong: like every other American genealogist who has ever lived, I would love to be able to say I really did have a ancestor who was Native American, even if she wasn’t a Cherokee princess. The problem is that all of the evidence was against it. All of the evidence, however, wasn’t enough for the other side in this debate. And that’s where the mtDNA comes in. Not mine, mind you. I descend from Wilmoth through a grandson, so I don’t share her mtDNA. But I have a second cousin, once removed, who is the daughter of a daughter of a daughter of a daughter of Wilmoth. If Wilmoth was a full-blooded Catawba, my cousin’s mtDNA should show it. My cousin was kind enough to agree to be tested, we sent the sample off to FTDNA, and we waited. Whatever else she may have been, Wilmoth was not Native American, not a Catawba, and not the mother of this half-Native American son. Sigh… What was it I’ve been saying about a legal genealogist’s work never being done? Image in the public domain, courtesy of its author, Muntuwandi at the English Wikipedia project. Now, this is a wonderfully informative post, Judy, and the links are so useful! One day I’ll think about having mine done – a small lottery win would be nice, for instance. In the meantime, since my maternal ancestors were in NE in the 1600s from England, Scotland and the Netherlands, I don’t think I’ll find much new information. However, getting my brother’s DNA done would be helpful, in terms of how we relate to the Ulster Gillespie lines (and back to Scotland). Definitely no exotic, surprising, or strange results expected. We DO like to be special in some way, don’t we, us humans. Thanks for another great ‘lesson’. Thanks for the kind words, Celia! DNA can sure provide us with some answers… even if it’s not always what we want or expect! Hope you can get the testing you want done soon. Nice post! It reminds me again that I’d like to get some DNA testing done! I should put it on a to-do list… Thanks! I am aware of the anomalous results among the Cherokee, Randy. Even there however this would be an anomaly among the anomalies. I’m confident, with the usual requisite degree of scientific certainty (meaning things could change if there’s a new discovery somewhere), that Wilmoth was not a Catawba. Better take a look at the Solutrean Hypothesis and some of the latest dna findings of the Cherokee and other east coast native tribes. You might have to re-think your cousin’s U5 mtdna not being Native American! Uh… no. That’s called a hypothesis for a reason. And somewhat charitably. That’s a Fairytale white folks latch on , to pretend they somehow colonized the Americas before the Native Americans got here. It’s just a false balm for their insecurity that comes with the usurpation and theft of the two continents. It’s a pathetic rearguard coping mechanism that doesn’t fly in the face of the achaeological, linguistic and genetic evidence. Well, we’re related! I’m H3g too (23andme), though Family Tree further refined it to H3g1a. On Family Tree I don’t have any exact matches but I do have a few 1-step matches as well as 2-steps and 3-steps. Still looking for that common ancestress, lol! But I did get some interesting info. My last known ancestress married in Armagh, Ireland 1814. She was Ulster Scotch, so I presumed that at some time the maternal line was in Scotland. My 2-step matches all posted genealogies with their last known ancestress in Scotland, ca early 1800s. But my 1-steps posted genealogies with a known ancestress born in the U.S. in the 1630s, parents came over on the Mayflower expedition. All those were of English origin. So, my 1-steps are more closely related to me and we don’t share at all a common ancestress after 1630. I then put the maternal line in England ca 1600 with my line going to Scotland some time, then over to Ireland and eventually Canada. And now this makes sense because I couldn’t figure out why I have so many English genetic cousins. Scottish, I could understand but not English. My paternal line is French Cdn…all French, no English there. My maternal genealogical line is all Irish with the exception of my earliest known direct ancestress (above). So that was some info I didn’t have before. At least that’s how I see it, trying to wrap my mind around where that 1 mutation occurred between me and my 1-steps. Could have been anywhere. I hoping for an exact mtdna match – might have a long wait, lol! It’s the fact that mtDNA can be so very far back that makes it frustrating, Lynn. And in my case I also have the complication of what’s called a heteroplasty (mutation) in one marker so I have no exact matches, and may never have any. There’s some thought being given to the possibility that such a mutation can be caused by cancer, an intriguing thought since I’m a cancer survivor. It’s not an easy type of DNA to use, Julie, except in very specific targeted test: does this person match that person? Judy – very interesting. Now I have a question – if I am trying to prove I share a 2nd great grandmother with someone and I have found 3rd cousin direct female line strangers and I am able to convince one to test will mtDNA testing do so and do I need her to do full sequence (assuming she agrees if I pay)? I know FF won’t work because we share the same gg-grandfather. I talked with Bennett Greenspan and he also helped me with questions by email so now I am confused. We should have an exact match, correct? I am reading all the archived posts and learning a lot – thank you for archiving them. Carolyn, to be matches in mitochondrial DNA (mtDNA), both you and your target person have to be in the direct female line from that second great grandmother — no males at all until the tested generation (a son on your side or a son of the last female in the other line would work since those males would have their mothers’ mtDNA). Realistically, you could START with mtDNA-plus testing, to at least tell you if you’re the same haplogroup: if you’re not, then you’re definitely not descended from the same woman. But if you do match, it means you have a 50% chance of being related within about the last 750 years or so. To have better odds of knowing for sure, then yes, you really do need to to the high level testing. Thank you. I have a limited paper trail and testing will verify what I believe to be true based on two aunts who are also cousins from this Wiedebusch side. I have her marriage, the fact there were no other families with that surname in Texas at the time, The answers on how many children living in 1900/1910 and what I know from my aunts. I am a direct female line and so is the distant and unknown to me 3rd cousin. I want to be certain there wasn’t an earlier marriage as my g-grandmother would have been so terribly young when she died in childbirth with a second child – 18 or less. first of all I am supposed to be a direct female of Lady of Cofitachiqui and I forgot her name.. and she is supposed tobe Catawba also.. but desoto dropped her off around COOSA which is creek/ cherokee country . I am also supposed to be a direct descendant of Ollie ninonee sister who married Old bark/ barker both daughters of chief Oconostota ..
Science has not one idea what history of native americans is and you should never call your ancestors liars . just don’t do it! they won’t like that . Science actually has a pretty darned good idea what the history of Native Americans is… and U5 it is not. they don’t know what they are talking about and formed all their theories and found the dna they wanted to find to ‘prove ‘ what they wanted it to be. the mean time we will get into a serious talk who was and wasn’t here when they start looking for and stop using the dna of the 1000000 ++ south Asian, Asian , Russian Siberian, and Polynesian slaves brought here as slaves for railroads and fir trading, pearl divers and rice workers in the last 500 years. until that day there can’t be a serious discussion. [email protected] just because your Mtdna came back as European, doesn’t mean that now the Cawtawba, or any other Native American tribe you fancy yourself belonging to is somehow descended from Ice Age Europeans! Give me a break! They have tested hundreds of Native American remains from before colonization, and none of them are U5. They have also tested thousands of living descendants who’s Mtdna Matches that ancient Mtdna haplogroups and sub ladies, none of them are U5, unless they have a European colonizer ancestor. 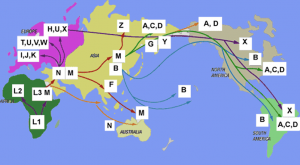 Their have been Mtdna testing since the early 90s and they have never come across a European haplogroup and subclades in a pre-Columbian context. Their is no evidence of a European Solutrean migration to America from Europe, and the Solutrean hypothesis is a debunked hypothesis that has gone nowhere since the 1890s when it was first proposed, not sure why it is arising now. But trying to force your very European Mtdna on Native American research and genetics just muddies the waters for serious researchers looking for answers on this site. Nae+ do you honestly think scientists are that stupid to only test modern descendants of Slaves!!? They have tested hundreds thousands of Native American people who are descendants of the fist people to step foot on these two continents now called America. They have also tested hundreds of Pre-Columbian remains from ancient burial sights thru out the Americas and they are all A,B,C, D and X Haplogroups. That’s it! So you are just reaching at straws, with your remark about how the only test East Asian, South East Asians and Russian Siberians. You obviously know both about science, or DNA testing. 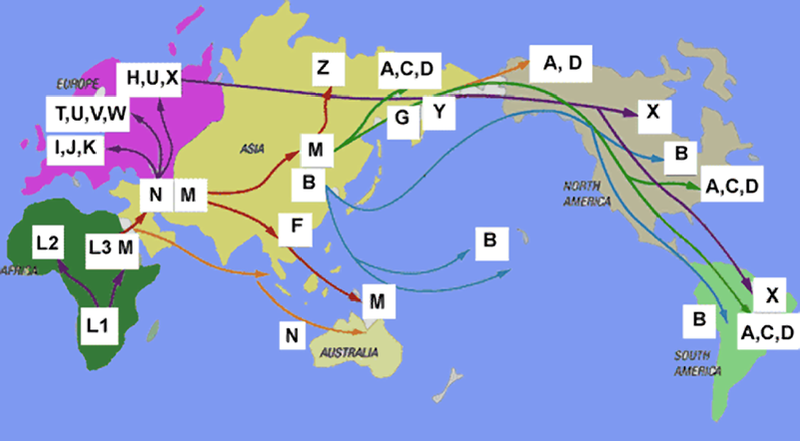 You are not Native Native American, with you U5 haplogroup, you are a European. No matter how much you try and rewrite history with your debunked Solutrean Hypothesis! U5 is Sami not Native American. U5 is a very broad haplogroup and generally regarded as the most ancient of the strictly European mitochondrial haplogroups. While there may be Sami people who were/are U5, it’s not exclusive to the Sami by a long shot. Why would someone be so invested in finding NA DNA and ancestry, that when they find none, they are so invested in this family myth they at once throw a big tantrum, then try to alter the facts, and years of genetic research, just so they can keep cherished family histories that their great grandma was a Cherokee pricess!? Delusional or what! ?